The Performance calculator may be accessed by going to Results > Performance Calculations or by clicking the button on the toolbar. The performance calculator will take the data it's looking at from the last section of data you have highlighted. If you have highlighted more than one choice on the Lap And Sector Times, the Performance Calculations table will use the last box you highlighted. If you are highlighting several pieces of data at once, i.e. if you have multiple map traces on the Track Map, the program will use the data from the first section of data it meets in the .RUN file. Trigger acceleration for test is used to determine when the vehicle has started and stopped moving from rest. For example, if the performance table is calculating for the time to accelerate from 0 to 10mph, it will actually be looking for a point in the data that has a speed less than about 2mph and where the g force goes from less than the trigger force to above the trigger g force. This is done because, even with high accuracy GPS speed data, there is still a low level of error that effectively stops it reading EXACTLY zero mph. Also, triggering timing from speed is not a good way to do timings. For example, for the average sports/road car that accelerates at 0.5g it takes 0.1s to go from standing start to 1mph, and in that time it moves just 2.5cm. Assuming that the GPS system has an error of about 1mph and 50cm, then the system would not be able to reliably detect that you had pulled away from rest for over 0.1s, making the timing very inaccurate. In contrast, triggering using a change in g force makes sure that timing starts as soon as you start to move. A similar argument can be made about braking timings. The triggering g force depends on the application. Normally, 0.1g is a good compromise but you might like to experiment and look at the data to optimize this. "Zero" speed threshold is used to prevent the slight inaccuracies inherent in every GPS speed measurement from spuriously triggering the performance calculations. As before, 3 mph is a good compromise value, but a little experimentation with recorded data may allow optimization. 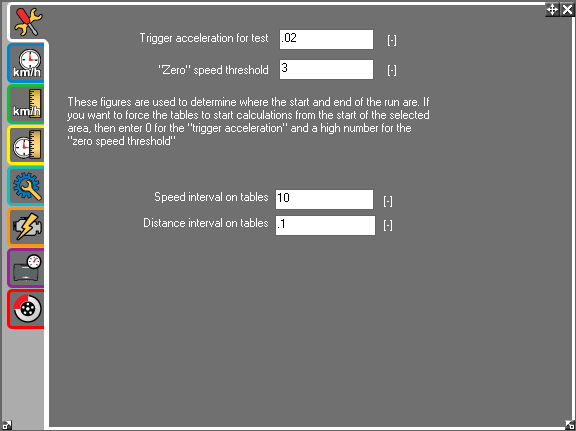 Speed/Distance interval on tables allows you to define how large the gap between each stage is. i.e. how many mph apart the calculations are made for speed and how many km apart the calculations are made for distance.